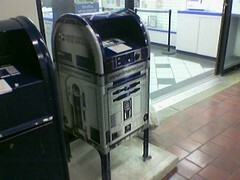 One of those Star Wars mail boxes sits outside the post office at Union Station. It does not roll around the station, beeping, nor does it project holos of Carrie Fisher, nor does it perform astromech droid functions on Rebel Alliance fighter spacecraft. It will, however, keep your Death Star Plans and other mail safe till the mailman picks it up. More info.